Hope International University was named to the coveted Military Friendly Schools® list by Victory Media, the premier media entity for military personnel transitioning into civilian life. The 2014 Military Friendly Schools® list honors the top 20 percent of colleges, universities and trade schools in the country that are doing the most to embrace America’s military service members, veterans, and spouses as students and ensure their success on campus. The continual recognition of HIU as a Military Friendly School exemplifies the University’s leading practices in recruitment and retention of students with military experience. Hope International University offers a number of military benefits including an active duty tuition discount, the Post 9/11 and Montgomery GI Bills, and accepts military credits earned through service schools. In addition, the University is committed to the standards of the White House’s Principles of Excellence (POE). A complete list of benefits, program information, and additional resources for servicemembers is available at www.hiu.edu/military. “It is an honor to serve our veterans and those in active duty by helping them pursue their educational goals. We are committed to providing our military personnel with the tools needed to succeed, and to helping them get the most out of their military benefits and other available aid,” said Teresa Smith, Vice President for Enrollment Management. Now in its fifth year, the 2014 list of Military Friendly Schools ® was compiled through extensive research and a data-driven survey of more than 10,000 schools nationwide approved for VA tuition funding. Each year schools taking the survey are held to a higher standard than the previous year via improved methodology, criteria and weightings developed with the assistance of an Academic Advisory Board (AAB) consisting of educators from schools across the country. 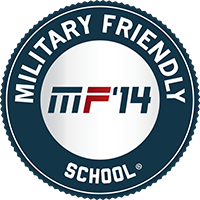 The Military Friendly Schools® media and website, found at www.militaryfriendlyschools.com, feature the list, interactive tools and search functionality to help military students find the best school to suit their unique needs and preferences.